Understanding why and how water that is supposed to be safe to drink that has been improperly stored or used in the home can become unfit for drinking and dangerous. Presenting good practices that you can follow to store water in the proper conditions for household use if it was clean, fit to drink water to begin with. This file does not therefore mention the various techniques for treating water ; please refer to the files that concern that question if you are in need of those techniques. 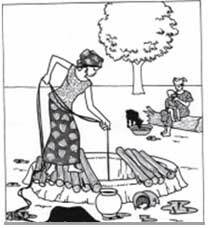 The problem of storing water for domestic use is a very old one, but it continues to concern many countries even today, particularly in places where they do not have running water in every household. 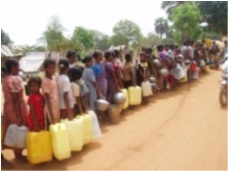 Someone must often travel long distances to fetch water from a river or well and then it is stored at home because it would be too much trouble to be constantly travelling back and forth to the nearest water source. This issue is all the more important because it concerns nearly three billion people who do not have access to water from nearby taps. Because it can cause multiple illnesses. People suffer some four billion diarrhoeal episodes every year, 88% of them due to unclean water and also to poor hygiene and sanitation, both at the water source, during transport and in the home. These illnesses cause nearly 1.8 million deaths every year, the majority of them among children under the age of 5. In addition, in many countries, the Aedes mosquito which is responsible for spreading dengue fever reproduces in small amounts of standing water found inside or near homes. The most severe form of the disease, Dengue Haemorrhagic Fever, is very serious. In this case too, children are the most affected. 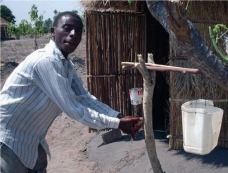 Besides these two examples, drinking unclean water can spread gastroenteritis, cholera and more illnesses. In general, good health is at risk when bacteria and viruses contaminate drinking water ; this happens particularly through unhygienic practices during transport or at the home or alternately if the water was not safe to drink to begin with. Transporting water in containers that have not been washed or not systematically washing one’s hands before doing anything with the water are just some examples of bad practices that result in contamination. This is why many people who have access to improved water sources, either taps, protected wells or other improved sources are in fact exposed to contaminated water. and use of water even if they already have access to treated water. These recommendations are of particular interest to households that do not have access to running water, generally people who live in areas with poor service such as rural areas and some areas around urban centres or very poor neighbourhoods. However, they are certainly not the only people concerned. The procedure consists actually in a series of good practices that, taken all together, will ensure that household water is stored and used under the correct conditions. It is assumed in the recommendations that follow that the water being stored is clean, meaning that it has already been appropriately treated. a) What type of containers to use ? Water must be stored in a different container from the one used to collect or transport it. For storage, containers with a narrow opening are best, especially if there is a way to close them (cap, cover, etc.). This generally means bottles or jugs. If you have no containers with a small mouth, containers with a large opening can be used (buckets, pitcher, etc.) as long as they are covered with a top or a clean cloth. Non-transparent containers are the best choice (unless the water was purified by leaving filled clear plastic bottles in the sun, in which case those bottles can then also be used for storage). This method requires the material to be washed frequently, and additionally, if water in the container becomes contaminated, do not add clean water to it as that will become contaminated, too. To avoid contaminating the water, there must be no contact between the water and the user’s hands. Using a ladle with a long handle or a tap installed at the bottom of the container are very good solutions. If bottles are used, the water can be poured directly into clean glasses or cups. This water should be used for cooking or drinking. If untreated water is relatively clear, it is not absolutely necessary to treat it before using it for such domestic uses as laundry or bathing. It is absolutely necessary to wash hands with soap before doing anything with drinking water. Similarly, the utensils used (storage containers, ladles, glasses, cups, etc.) must be regularly cleaned carefully. It is recommended that water be stored in a clean place out of the reach of children and animals. You should therefore avoid storing water on the floor. Containers with small openings are recommended for storing water because it is harder for any contaminating elements to get into such containers. However, they are harder to clean – it is recommended that you use small stones or a bottle brush. If you do not have a brush like this, you can make your own similar tool by wrapping a piece of wood in a clean cloth. The ideal container then is one with a small opening but that is big enough to clean easily. You should disinfect this water before drinking it. There are several ways to do this. The reader can refer to the files on this subject mentioned at the beginning of this document. The main methods are exposure to UV rays in sunlight, boiling, chlorination or filtration through sand or a ceramic filter. This is not merely an advantage ; going through all of these good practices is a real necessity. But these practices do mean taking particular caution and they may seem like too much trouble to people who have not been properly informed about how important they are. In this case, the methods used cost almost nothing. It is more a question of forming good habits for using water than implementing technical solutions. The only real costs might be the purchase of some containers that are good for storing water. There is nearly no cost for cleaning. These investments are truly minor when compared to the medical costs and the problems that are the result of illnesses related to drinking unclean water. - The IFRC (International Federation of Red Cross and Red Crescent Societies, Geneva) (2008) also published a very interesting, 44-page, nicely illustrated document in 2008 that explains both how to store and how to treat water, more specifically in a crisis situation : “Treating and storing household water in an emergency situation” available on-line at : http://www.ifrc.org/Global/Publications/disasters/142100-hwt-fr.pdf.